MASTER AND SLAVE WIRED OR WIRELESS? 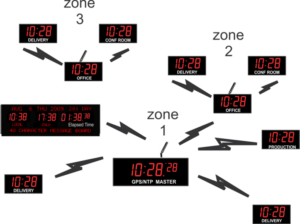 Now that we have a master clock, we need to sync all the slave clocks to our master clock. This can be done via a cat 5 twisted pair wiring in a daisy chain fashion or using our wireless technology to sync the clocks. Similar to the GPS and NTP each system has its own advantage and disadvantages. Wired system will cost slightly more at the installation phase mainly to run the wires between all the clocks, and depending on your specific situation the total cost could be higher or lower than wireless system. if the building has a lot of steel or thick concrete with steel. to accept the signal. In some installations you will need a repeater or a master slave clock to carry the signal farther. the US and Canada. In the open they can range a distance of up to 20 miles, and inside buildings some design and some trial and error will be required to get the optimized setup. Incase of data collisions they randomly change packet time to reduce data collisions. And with over 32 possible channels they can operate in a very noisy environment. Need help to decide between wireless or wired system? Want to test our affordable 6 sets synchronized clock system? Our clocks are installed in many Sport Arenas, Manufacturing facilities, government, military, banks and schools around the world.